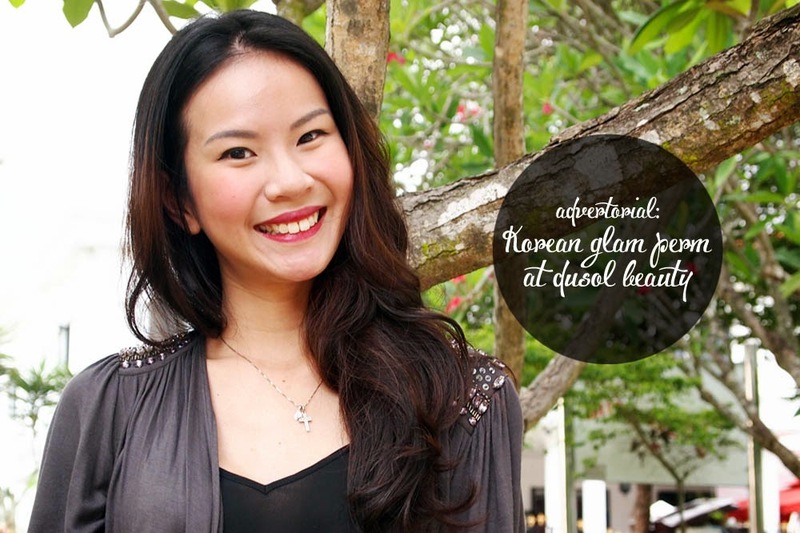 Recently, Ash and I got a new hair sponsor... and it's none other than.. Dusol Beauty! 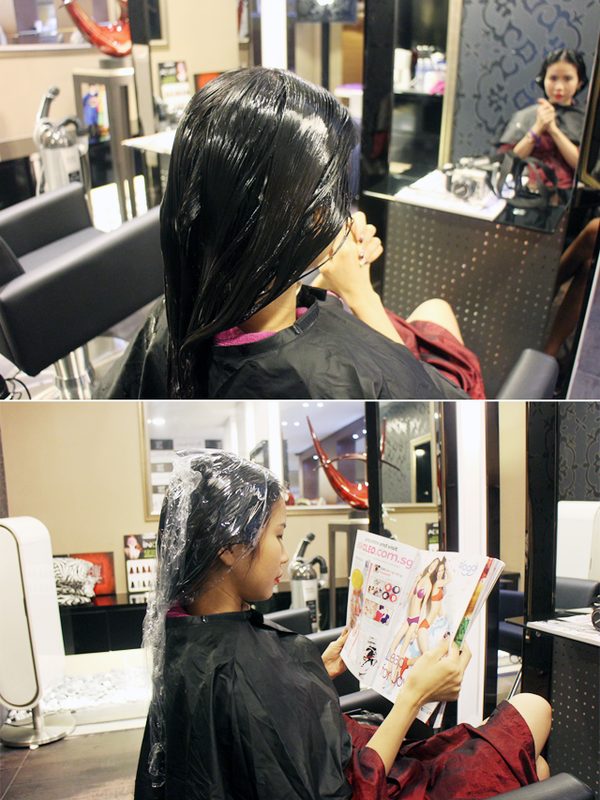 :) If you remember, my last visit to them was about half a year ago, fully paid by myself, for Volume Magic Rebonding. Apparently, that post was such a hit that Edward, my amazing hairstylist, decided to sponsor me with a new hairstyle! What are the chances!? And how blessed could we be!? Of course, I told him to do as he wished with my hair because it has never gone wrong before, and he told me he would like to give me some natural loose waves. Perfect! Because it was just what I had been thinking about doing for awhile - so yes, here's my post on how I got these lovely curls, otherwise known as the Korean Glam Perm at Dusol Beauty! So if any of you aren't familiar with Dusol Beauty, it might be because you still associate it to Spa Scene, which is what it used to be named! Its one of Singapore's very authentic Korean salons, and its not only because their hairstylists are Korean, but also because the products they use are from John and Jack, a popular brand that is made and imported from South Korea as well! Isn't that really cool!? But what I really want to bring your attention to is Edward Kim, my kind and amazing hairstylist! :) I've been going to him since 2010, when my Korean friend introduced me to the salon! Back then I was searching for a good place to do the Volume Magic Rebonding treatment, and I heard he was the best! Ever since then, I've not looked back or looked for any other place. Edward is very meticulous in his job and never takes any comments or suggestions lightly. Whenever I mention my discomfort with any process, he either assures me that my worries are unfounded or he will try something else. Now, this isn't only because I'm sponsored. I've been going to the salon way before this blog even started! I seldom trust people with my hair, and its great to know I am in safe hands. Seems pretty funky doesn't it, especially with the machine! But no worries at all! What it ensures is that it takes the heat away from your head and hair (though to be honest there is almost zero heat involved, so your hair is less damaged), and you end up with beautiful curls! Do note: My process is slightly different by one step, and if you want to see what it is, just read on to see my documentation of it! Dusol Beauty uses Vodana hair products, which can be found on their website John & Jack. Their products are all imported from and made in South Korea, so you can be assured of their quality. 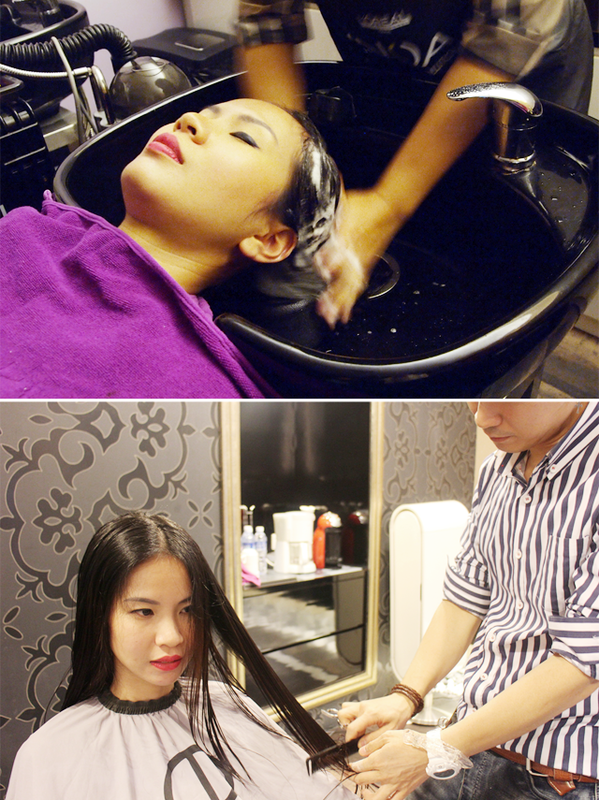 Do not worry about anything being sub-standard because the salon keeps very true to their principle of quality! Here's a fun fact: The person who owns John & Jack also runs the salon, and also brings in their own brand of items into the store for usage! 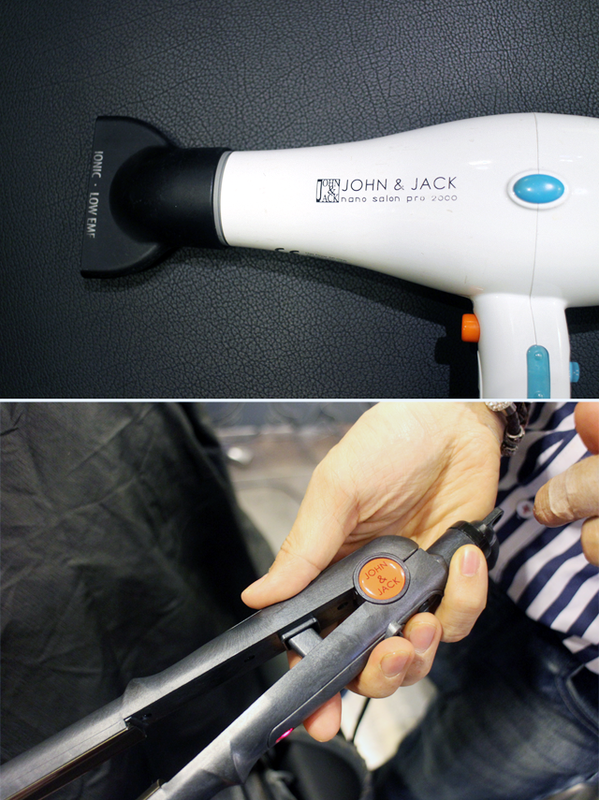 Here are some examples of their John & Jack hair tools! There are, of course, many more besides this but we thought a good close-up of a few items would be better! I think it's great that Dusol Beauty takes everything seriously - down from products to tools. It makes me feel like they know what they are doing, and are included every step of the way from the creation of products to the understanding and using of them. This sets me at ease because there's nothing better than someone who is well-informed. The process started off with the washing of hair then cutting it. At this point of time, my hair was about waist length already to Edward trimmed it to about chest level. I suppose he didn't make it shorter because it would be better to show off the curls this way. Once he's done with cutting, my hair is blown dry till its only very very slightly damp, and then he proceeds to put the perming lotion onto my hair. Saran wrap is then placed around my head for better absorption of the lotion. In the mean time, I read a magazine and chill out because the waiting time could be about 20-30 minutes. The machine beeps when it's done, but Edward still checks intermittently throughout to make sure everything goes smoothly. He removes the curler thereafter and lets the curls hang. 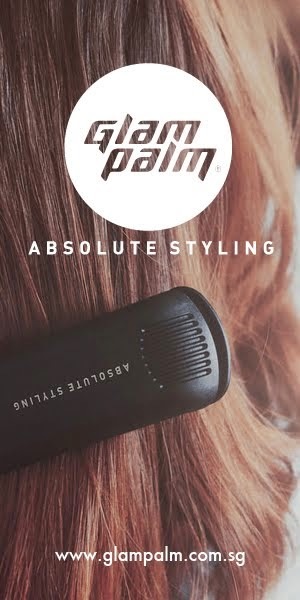 He later proceeds to take a hair straightener (shown in the Products section above) to create a "Volume Magic" effect to the hair near the crown of the head to the start of the curls. This smoothes the hair out and makes it all soft and shiny! It also prevents any weird kinks from occurring. There is also a nice transition created between the straight hair and the curls so everything looks like a slick wave down. Whoo! This sounds like a long process but bear with me, it's soon to be over! Now, my hair is complete and ready for drying into very very luscious locks! Here's the final result after approximately 3.5 hours! Whoo! It was quite an experience, hahaha. I can only imagine my boyfriend whining away if he sat down with me the whole way; but luckily I've got this amazing partner called Ashley who patiently waited and took all the wonderful pictures above! This is about... 3 weeks after the treatment. As you can see, the curls are much softer and wavier. They're not as curled up/tight as the original result! I suppose it's also because my blow-drying methods are different from Edward (if I ever remember to blow dry hahaha), and most of the time I wear my hair up in a big bun so the curls are also "enlarged" in that manner. No issue with me at all because the waves are so natural - Ashley calls them "Second Day Curls" because they look like I tonged my hair the day before and left it till the next day! This is what most of us aim for right!? Some of my friends have even made comments on how well I use a curler, only to end up being shocked that it's a perm! Love it. Love it so much, let me spell love for you. L.O.V.E. Here's where I have to give you guys some tips and advice, as a honest and responsible blogger. Your hair will definitely still suffer a little damage. It's a perm after all, not a miracle. 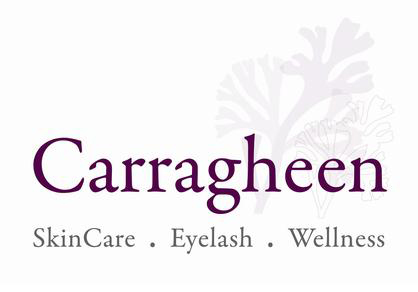 Do take care of your tresses! Condition it at least 3-4 times a week and try to apply some serum whenever you can; I use Original & Mineral conditioner and a 20 cent amount of Orofluido hair serum/ Shea Terra Organics Moroccan Argan Oil to my hair ends. I don't even do treatments (like sit around 15 minutes with stuff in my hair), in case you're wondering. I only condition my hair for about 1 minute - yes that short a time - whilst I wash my body and I'm done. It's that simple - I know people who do this even without perming or coloring their hair anyway. 2. Styling... or No Styling.. It's up to you, personally I don't bother at all hahaha. I suppose you are supposed to, with the blow-dryer but I am just so lazy. However, isn't that good news for you ladies who are just like me!? I mean, there are some days where you come home/go out after showering and don't want that hassle right!? All I do is allow my hair to dry completely (air dry, blow dry, cool dry, whichever), then do a low bun at my nape of the neck, and clip it in. I then do whatever else I need to do for 1-2 hours before I sleep, let the bun go, and I wake up with pretty curls. Isn't it easy!? I feel it is my personal obligation to tell you not to sleep with your hair wet with this perm (or for that matter, ever) because you will wake up with really REALLY curly and tangled hair! It's also going to be slightly frizzy because your head messes your curls up without letting them set properly and you will wake up looking like the swamp monster. Don't do it. This hairstyle definitely isn't as fuss-free as my Volume Magic Rebonding, but is really as fuss-free as it gets for a perm! I even love how I do not need to worry about rubber band marks in my hair after tying it up, it just adds another dimension of waves to my hair! Dusol Beauty is currently having a promotion, as shown above, so don't miss out on it! Your hair looks so gorgeous, stunning photos!